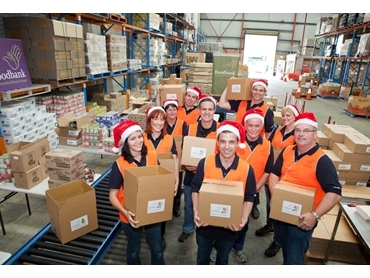 CHEP Australia employees packed Christmas hampers recently at the Foodbank NSW Distribution Centre. Joined by Australia & New Zealand President, Phillip Austin, the CHEP team packed an impressive 512 Christmas hampers onto eight CHEP pallets, with goods provided by companies including Nestle, Unilever and Rinoldi. The Foodbank hampers are bound for charities, large and small, all over New South Wales and the ACT who will distribute them to families in need, in time for the festive season. Foodbank CEO John Webster says that the role played by CHEP underpins Foodbank’s supply chain nationally, helping them move the donated food to where it’s needed. CHEP received the 2012 Foodbank Collaboration Award at the Australian Food & Grocery Council Leadership Forum for their efforts. Mr Webster added that CHEP’s contribution in 2011 represented an in-kind donation of $800,000 when they helped Foodbank move 24,000 tonnes of food, providing more than 32 million meals to those in need. CHEP equipment travels from Foodbank donors including growers, FMCG manufacturers and retailers across the country to Foodbank warehouses in NSW, QLD, VIC, SA, WA and NT and then out to charities in all states of Australia. On a daily basis, Foodbank collects and distributes food to thousands of charities nationally, with the support of donors from the Fresh and FMGC supply chains. According to Phillip Austin, CHEP has provided more than 300,000 pallets as well as bins and crates for fresh food in their 18-year partnership with Foodbank. CHEP is a member of the Foodbank Fresh Produce Industry Group, which is working to increase the volume of fresh fruit and vegetable donations.